Welcome to Roll With It! Enjoy the thrill of a great winter sport! Downhill bi-skiing ("sit-ski" tethered by an instructor) for beginning to intermediate level skiers is being offered at Powder Ridge Ski Area in Kimball, MN. 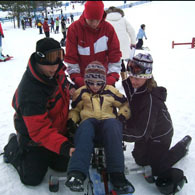 Get one-to-one instruction in bi-skiing for people with physical disabilities. Reservations are required to guarantee bi-ski availability. Call or email to reserve your lesson(s) date and time. First lesson is FREE!! Lessons include lift ticket, bi-ski, helmet rental & private instruction. Cost is $15 for each 1.25 hour lesson. Please note, there is a 200 pound weight limit for all skiers due to equipment manufacturer specifications and ski instructor safety.